MTV EXIT (End Exploitation and Trafficking), in partnership with the Philippines Government, the United States Agency for International Development (USAID) and the Australian Government’s Agency for International Development (AusAID) today announced the return of the MTV EXIT campaign to the Philippines with a free Live concert in Manila on October 29. 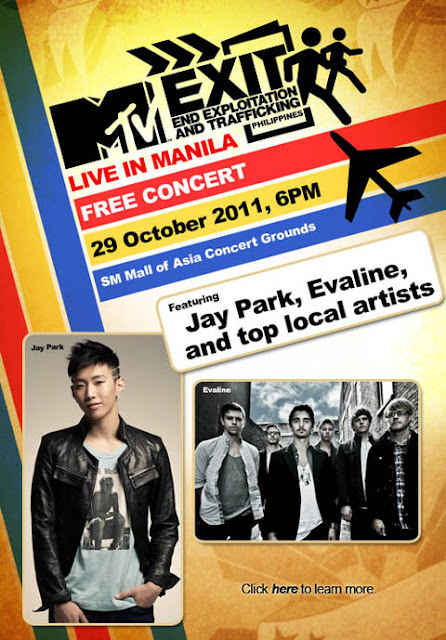 MTV EXIT Live in Manila will bring together international and local artists to raise awareness and help prevent human trafficking and exploitation. The free outdoor concert will be headlined by Korean pop sensation, Jay Park, and held at SM Mall of Asia concert grounds. Joining the line-up will be Californian alternative rock band, Evaline and top local artists Parokya Ni Edgar, Pupil, Ebe Dancel, Itchyworms, and will be hosted by MTV VJ Holly, including a special appearance by popular Filipino celebrity, Dingdong Dantes, who is the new MTV EXIT Celebrity Ambassador in the Philippines. MTV EXIT and Visayan Forum Foundation (VF) will also be hosting the first-ever National Youth Summit for the Movement of Anti-Trafficking Advocates (MATA) from 24 October to 28 October to empower youth leaders from across the Philippines to spread key anti-trafficking messages. The Summit will bring together 110 youth leaders, ages 16 to 26 years old, for a series of workshops conducted by media professionals from the film, theatre, and music industries. In addition, MTV EXIT announced the release of its new half-hour Filipino documentary film,Enslaved: An MTV EXIT Special, hosted by Dingdong Dantes. The documentary will give audiences a real and rare glimpse into human trafficking and exploitation in the Philippines, telling stories of human trafficking survivors and highlighting what everyone can do to help end this horrific crime. Enslaved: An MTV EXIT Special will premiere on GMA NEWS TV Chanel 11 on November 27 at 9:55 PM.